If you’re used to getting ordinary white marshmallows in a plastic bag at the grocery, Shauna Sever’s new cookbook will expand your consciousness like a marshmallow in the microwave. 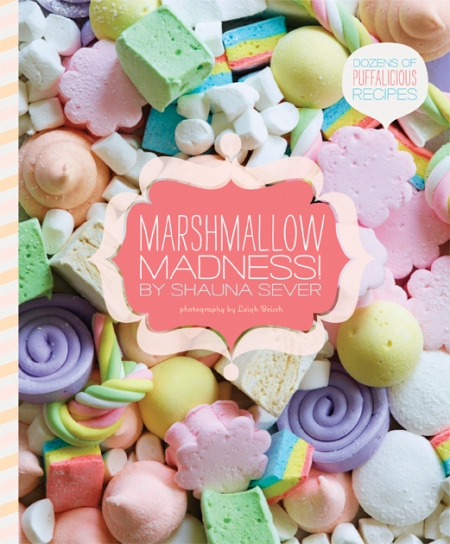 The sugary confections she makes in “Marshmallow Madness” (Quirk Books, $16.95) – look for the cute puffy cover – go way beyond the little pillows of fluff that you pop into your hot cocoa or use to make Rice Krispie treats. She introduces new flavors, from strawberry and banana to root beer float. Sever’s book also includes fancy-pants marshmallows like sea salt caramel swirl, pineapple-rosemary (Rosemary? Really?) and maple bacon. In an interesting twist on the idea of Jell-O shots, Sever includes cocktail-inspired flavors such as margarita, buttered rum and fuzzy navel. And yes, they do contain alcohol, although I wouldn’t suggest roasting these over an open campfire.